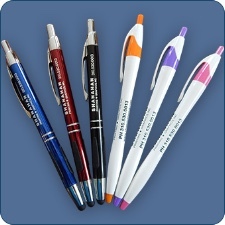 After T-shirts, the second most popular promotional item is Pens, making up 8% of the Promotional Product market! When you get your new Notecards, you may as well order a few pens to write the notes, or give to your clients with their notecards to reinforce your gift. To start you search of pens, click http://shop.shanahanprint.com/pens.htm or describe below what type of pen you are seeking.